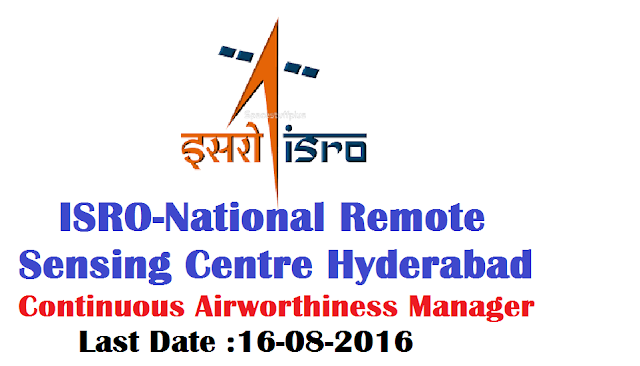 NRSC invites Applications for the position of Continuous Airworthiness Manager on CONTRACT basis, at Hyderabad, initially for a period of 3 years. Qualifications Required :Engineering Degree in Aeronautical/ Mechanical/ Electrical/ Electronics/ Avionics (with minimum aggregate of 65% marks or CGPA of 6.84 on a 10 point scale). Age Limit:There is no age limit. Retired persons also can apply. * Eligible candidate should fill the form following the proforma in the attached pdf. * Attach all the required document with valid personal details. Self attested copies in support of educational qualifications, testimonials, licenses & valid experience should be enclosed along with the application. - Candidates short listed based on Qualifications/eligibility criteria shall be called for a Personal Interview at NRSC, Hyderabad. - Call letters for Interview shall be sent by email/Speed Post to all the short listed candidates.